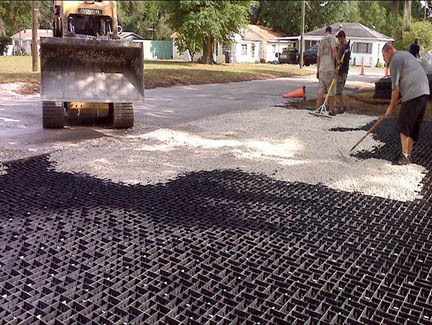 The GeoPave® Permeable Pavement System provides a confined strengthened aggregate roadway surface and functions naturally as an onsite retention system for stormwater. The GeoPave® system consists of GeoPave® units, a gravel base course below and open-graded gravel infill in the GeoPave® units. A geotextile and /or geogrid underlayer may be added below the aggregate base. Additional storage capacity can be added by increasing the base gravel thickness below or connecting the system to underground storage tanks which Layfield also supplies. The system can be designed for heavy loading including heavy fire trucks. The GeoPave® units are made from reclaimed polyethylene that are interconnected together with metal "U-Clips", creating a strong load distribution system. A monolithic mesh bottom keeps aggregate confined. Each paving unit is 50 mm thick and 1 m long X 0.5 m wide each. Applications include emergency & utility access lanes, lay down yards, roadways and parking lots, driveways, walkways and trails. For a vegetated paving system we recommend our Geoblock® system.